So The Legal Genealogist is off today to sunny Santa Rosa, California, for this weekend’s spring seminar of the Sonoma County Genealogical Society. These are called the Collateral Inheritance Tax Records, and there’s some good news-bad news we need to go over. The good news is that some of these have been digitized and are available online. The Sonoma County records for example, are in the collection entitled “California, Wills and Probate Records, 1850-1953” on Ancestry.com.2 What you’ll find there is four volumes: volumes 1-3, for the period 1906-1908, are with the Probate Court Minutes, Volumes 59-61, 1919-1920, starting at image 632 and going through to the end at image 893; while volume 4, 1906-1935, is in a separate set of some 65 images (including cover sheets). The records for San Francisco are also online in the Ancestry collection: some 587 total images (including cover sheets) for the Collateral Inheritance Tax Receipt Books, 1893-1921, are online there. The bad news is that not all of these records appear to have been digitized — or even microfilmed. It’s hard even to find out what records may still exist. I stumbled across the Sonoma County records getting ready for this weekend’s presentations, and only found the San Francisco records by searching for terms like “California collateral,” “California inheritance” and California tax in the FamilySearch catalog. So what it really means is you may need to hunt for these records. 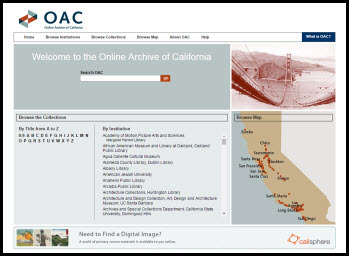 One place to look, of course, any time you’re looking for California records is the California State Archives, but don’t overlook the Online Archive of California, with its catalog of contributing institutions from around the state. It also means you may need a road trip or to hire someone to act as boots on the ground. And the possibly bad news when you find them is that not all of the record books are the same and not all provide the same level of information. The Sonoma County books on Ancestry, for example, distinguish neatly among beneficiaries, listing relationships. The San Francisco County books on Ancestry show who paid the tax and it was often the executor, administrator or attorney for the estate on behalf of the estate or the heirs — with the heirs not named. So the bad news is that these records are not going to be the easiest things to find for all parts of California. The good news is that they’re worth finding if they still exist, even if your family isn’t in the one percent bracket like the Wensingers were. I have an ancestor that abandoned his family in Ohio for the gold rush in 1852…he is on the voting lists up until 1890 and then is gone. I’d sure like to find something like this for Sonoma Co. but it looks like what’s up is too late. He is an illusive guy that John Carner! Wouldn’t the executor or administrator of the estate habe been required to file an accounting showing the items of property and cash collected and what became of it? Yes, there should have been additional documentation. Whether it survives, whether it’s been digitized, are other questions.